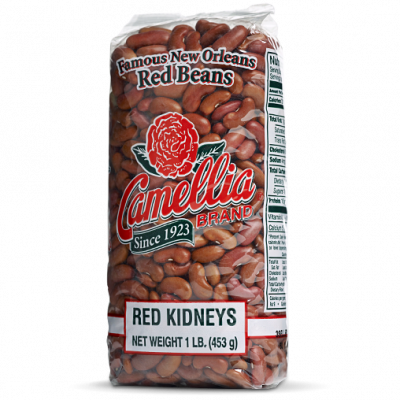 Flavorful, inexpensive, and filling, the combination of red beans and rice is an iconic part of Mardi Gras celebrations. Everyone makes them little differently, but no one disputes that homemade is the way to go. 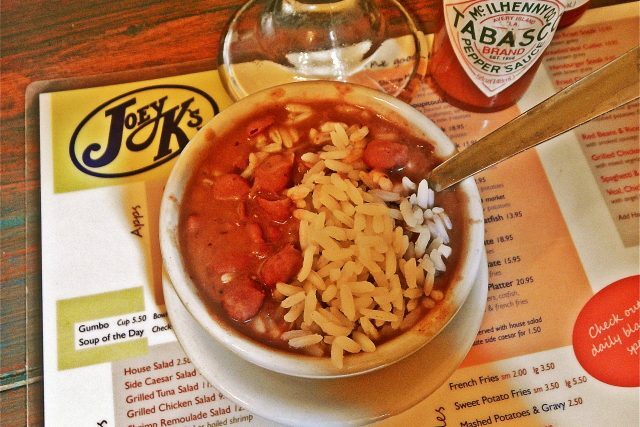 If that familiar craving hits while you’re out catching beads, and your mom’s kitchen isn’t on a parade route, here are a few suggestions to tide you over. 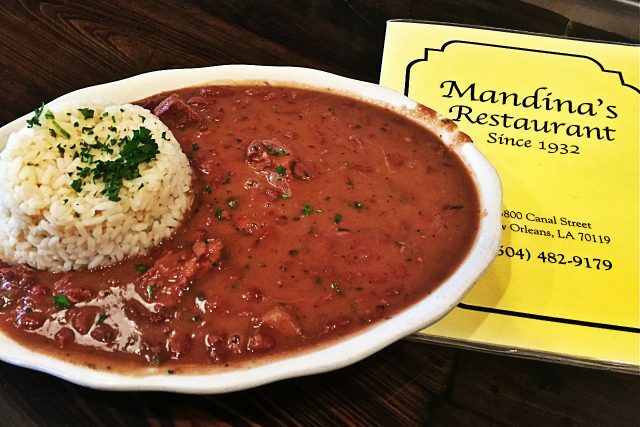 Located in Mid City, this true-blue New Orleans neighborhood stalwart only serves red beans and rice on Mondays—so Lundi Gras would be an excellent day to visit. Long a local’s favorite dish, the beans here are cooked until they’re soft but still more or less whole and suspended in their own medium-density, pleasantly mild gravy within which floats a large timbale of long grain rice. Enjoy your beans with smoked sausage ($10.95), a breaded and fried veal cutlet ($13.95), or with a pork chop ($12.95). Any way you have ’em you’ll get a basket of sliced French bread and butter for the table. Mandina’s, 3800 Canal Street., 492-9179, mandinasrestaurant.com. Warren LeRuth, the late, great restaurateur, chef, and oft-time culinary chemist, was brought in by Popeye’s founder Al Copeland, Sr., in the 1970s to create the chain’s justifiably famous red beans and rice, the recipe for which is top secret. Cooked until they are a creamy mass with very little texture, the thick, vaguely smoky beans are the standard bearers for many. 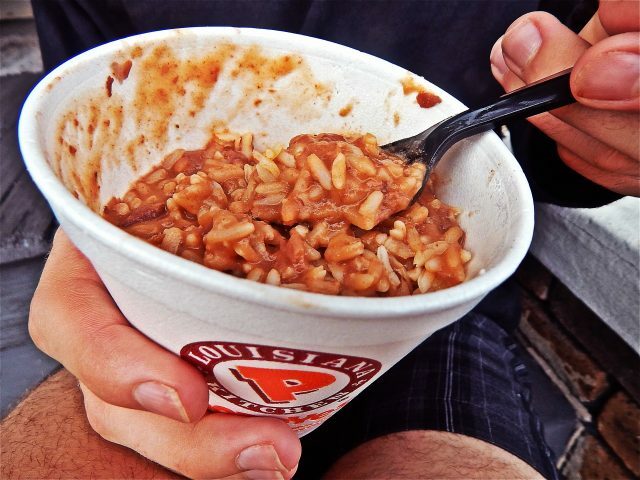 Served in Styrofoam to-go containers (regular, $1.79), (large, $3.99), $), Popeye’s red beans are particularly satisfying when enjoyed curbside from the container with the spork (spoon/fork hybrid) you’ll find in your bag.Various locations including: 4238 S Claiborne Ave, 269-8171; 4905 Westbank Expy, Marrero, 340-1003; 7100 Westbank Expy., Marrero, 347-3206; 1243 Saint Charles Ave., 522-1362; 3100 S Carrollton Ave., 486-6521; and 621 Canal St., 561-1021, popeyes.com.